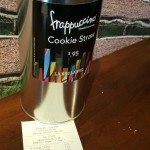 Do you like the cookies straws at Starbucks? Here’s how you can get a whole tin of them for free. Use your MyStarbucksRewards rewards! Each tin is $9.95 and rings up as free with a MyStarbucksRewards Lucky Dozen reward! 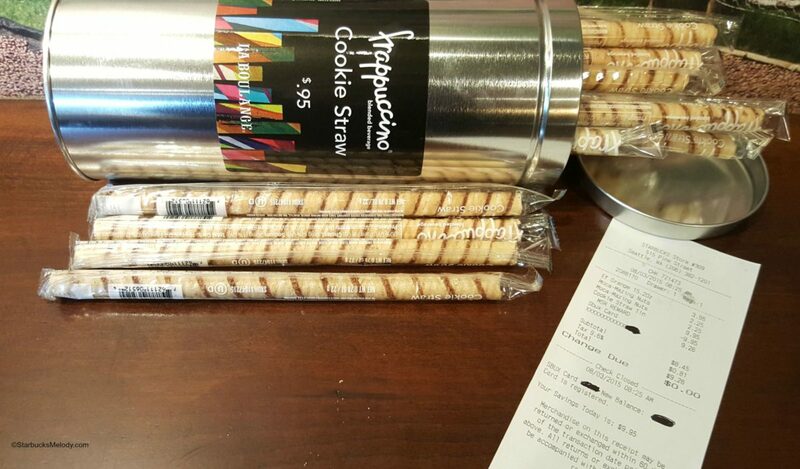 Your barista can find the whole tin of cookie straws under the impulse item category on the register. You should do this quickly, if these cookie straws are tempting you. I’ve heard that many stores don’t have very many tins left! Each tin contains roughly 25 cookie straws. I got a free tin this morning, and of course shared them with colleagues at work. Not a member of MyStarbucksRewards? Grab any Starbucks card at the register and ask your friendly barista to load $5 on it. Then register that card here. That’s the starting point for joining MyStarbucksRewards. After that, I recommend that you download the Starbucks app for your iPhone or Android phone – it will make it much easier to keep track of stars and rewards. And please visit my very new Starbucks website, Pets of Starbucks! Don’t try this if you’re in Canada – apparently Canadian registers are set up a little differently and don’t have a button for a whole tin. Don’t try to scan a tin (I didn’t see a bar code on it anywhere yet people are telling me that partners are trying to scan it, and it doesn’t work.) I really didn’t notice a bar code, but there is an item under impulse items on the register – look for the whole tin there for $9.95. This doesn’t work as a partner food mark out, from what I’ve heard. Frappuccino of the Week & Drink of the Week! HOLY COOKIE STRAWS, Batman!!! And I have a reward to use by Friday!! Looks like we’re getting cookie straws! that’s crazy that it works on a reward! I wish I had known that when I used my last reward this morning! Oh well, if we could just get the s’mores chocolate bar here, i’d be happy with that! Hot dog it, I used my last reward just yesterday! I surely would have gotten the cookie straw tin instead of a drink. That’s a great deal, thanks for sharing! “The stores don’t have many tins left.” Does that mean that cookie straws are a limited time item? I picked one up as a reward to the astonishment of the store partners. They didn’t know. I was told @Meow that they were seasonal and are being discounted out. They are on sale for $9.95, and they have another wraparound label to be affixed to the time before sold. U have seen them for myself. Your store should be getting more if the SM requested them. I know more were ordered at the store I go to. @Chicago – Glad it worked! I’ve seen a ton of Facebook posts since my article on people getting free tins of cookie straws! @Joyce – I’m not sure if it’s different in Canada, but it took the SM, to tell the partner how to ring it up. Since they will be discounting the tins for sale soon,I would assume there should be a spot on every register to at least sell them, unless supplies and sales are limited? Thanks Melody for the heads up. This is a pretty good reward to give to the kids. … it worked – had 2 rewards – thanks for the tip! … the partners were amazed and showed them your email – they had not heard about it. @Chgo – I showed the barista this post too! They couldn’t find it so I just used my reward for a Green Tea Frappuccino. Oh well…. the code is on the POS under misc > impulse items. the key is cookie straw tin on the bottom right. I tried it and it works! BOOM! What a great way to maximize your treat reward, too. $2.50 frappacino with treat receip, add in your FREE reward straws equals happiness! Thank you so much melody. I picked up three tins today. With public schools starting this coming monday .. This will make a good treat and a good welcome gift for the teachers as well. I guess I will get a few more for free. Thank you again. Thanks! I promptly asked for a tin of cookie straws this morning at 5:30am on my way to pick up my son at the airport, and they had one and my reward worked! Thank Melody! I just did this at 8:30 in the Chicago suburbs. @MagicKat I’m confused. I just tried it right now at Westlake Center Starbucks – #3343- 8:05 pm pst – worked just fine! Got one more tin! ^ That was about 8:30 last night – it worked. It doesn’t look like (from my perspective) that anything has changed. I’m going to try again today then. I have no idea why it wasn’t working for me yesterday. @MagicKat – Is it possible that there’s something different if you’re trying it with a partner reward? I’ve heard a few people say that there’s no way to get a partner food markout as the tin … but honestly, that just doesn’t make sense to me? @Melody -Maybe? My gold account is linked to my partner card. I was trying to use my MSR reward, but I know the food markout benefit doesn’t work. I don’t think any of the ‘impulse items’ are eligible for that. Can’t use it on evolution fresh juices either unless that changed (I haven’t tried in months). I don’t know what criteria they use to select eligible items. Thank you ms melody. I just picked up three more tins about 5 minutes ago. Showed the partners where the bottom was as well. My wife and kids thank you as well. Worked for me last night at the Starbucks inside of QFC on Holman Rd. Thanks Melody! I tried yesterday afternoon and it didn’t work 🙁 The store manager said it was a glitch in the system that let it happen. Boo. @Rebecca – It really sounds like the store manager just told you “No” which I don’t know why that would happen – unless you’re in Canada – I’m sorry you experienced that. It worked just fine for me one more time about 3 hours ago. I then gave the tin to the store and wrote on the top with a sharpie, “For the partners at Store ?” (wrote the store number from the receipt) because at that point, I didn’t really need one more tin. Though I had shared two tins of cookie straws with coworkers who loved them – they would love it if I brought them more. If a nearly $10 item can be comped as a MSR, why doesn’t SB offer up a free half pound of coffee as a reward? Or even a boX of Via? For regulars who primarily buy whole beans to drink at home, that would be the most rewarding drink aligned with personal tastes. @Jenny – I’m sorry that happened to you. That’s not right, for many reasons. 🙁 And the last thing you should get is a lecture,… no good for the customer experience. So, 9 tins later, you’d think I was up to my ears in cookie straws. But you’d be wrong. I’ve eaten them all ….. I learned about this from a barista. A reward can be used for a food purchase as well as a drink, so when I went to use it I just told them I wanted to use my reward for the cookie Tin and it worked. I didn’t need to give them a special code. So happy! Did not work for me. I tried last night at the Starbucks closest to my home … Chicago burbs. Barista told me that I could only have one stick/straw using my reward, but not the entire can. I happened to call Customer Service this morning regarding something else, but asked about using my reward for the canister. She also said, “no”… but then added that maybe some stores might honor it. Thanks for the heads up about the tins. I was able to get 4 of them at different Starbucks. Baristas weren’t sure I could get them as a reward, bot all were willing to give it a try. I am going to donate them to the upcoming golf fund raiser for the El Paso Brain Injury group so the opportunity could not have been better timed. I still have 8 more rewards to use by September but don’t know if I will attempt to get any more tins. Just wanted add to the list of those who were able to redeem rewards for tins. I visited an out of the way store, but the partners there were able to find me a COLD tin of cookie straws from the back fridge and also put together a second one by combining opened tins. Even though both were actually short a few straws, and the barista first rang my purchase as a normal sale (easily corrected), and of course ALL the straws I was given expire Oct ’15… I’m so glad this is a free reward!!! 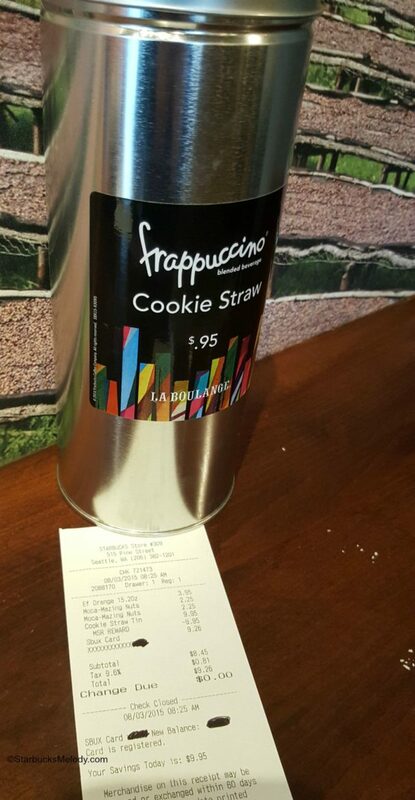 The transactions overall were super easy and no special screen was needed; enter reward, scan item barcode, scan Sbx card and boom… FREE TIN OF COOKIE STRAWS! I did this today!! My tin had 29 straws!! But I didn’t share hehe! Yum!! I just bought two tonight using my Gokd Reward card and the barista refused to honor the free one saying it must be wrong. I am calling in the morning to complain. Wow! That’s too bad Danielle! Glad you got some of the last tins though. From what I understand, once stores run out that’s it. It’s a seasonal item which is so disappointing as it’s the perfect compliment to a hot coffee/latte or hot chocolate. Hi Melody, Do you know if I can use my reward on cranberry bliss bars box? I wanted to know about the cranberry bliss bars box also. I need to use up a few rewards but I didn’t want to embarrass myself at checkout. Some baristas seem to enjoy saying no. I’ll report back after going to my local Starbucks, they are really awesome there and I feel comfortable asking. I’ll let you know what I find out! P, thanks for the info!